Found in FNA Volume 19. Treatment on page 172. Creeping roots usually dark brown or black, with scaly adventitious buds. Stems ± cobwebby-tomentose. Leaves: basal and proximal cauline often deciduous by flowering, blades oblong, 4–15 cm; mid and distal linear to linear-lanceolate or oblong, 1–7 cm. Involucres 9–17 mm, loosely cobwebby. Phyllaries: apices of inner acute or acuminate, densely short-pilose. Corollas 11–14 mm, tubes 6.5–7.5 mm, throats 2–3.5 mm, lobes 3–3.5 mm. Cypselae ivory to grayish or brown, 2–4 mm; pappus bristles white, 6–11 mm. 2n = 26. Phenology: Flowering late spring–summer (May–Sep). Introduced; Alta., B.C., Man., Ont., Sask., Ariz., Calif., Colo., Idaho, Iowa, Kans., Minn., Mont., Nebr., Nev., N.Mex., N.Dak., Okla., Oreg., S.Dak., Tex., Utah, Wash., Wyo., Mexico (Baja California), c Asia. 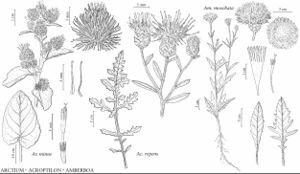 Acroptilon repens has been reported also from Arkansas, Illinois, Indiana, Kentucky, Louisiana, Michigan, Missouri, New York, Ohio, Virginia, and Wisconsin; I have not seen specimens from those states. This page was last edited on 24 April 2019, at 16:48.